This Mapleton Utah Park Meadows Home is SOLD. Mapleton Utah Park Meadows Home for Sale; Search Homes for Sale in Mapleton Utah. Our search offers the best online, live search engine in Utah County. The search has listings of all Mapleton Homes, condos, and townhomes for sale. When you subscribe to our Buyer's Club you will receive daily emails of every new listing and price change within your search criteria. You will have free unlimited access to every home listed for sale in Utah County. When you use our search you can save favorites, rank the one's you like, and make notes. If you have questions about the Homes you have seen, Team Teasdale Realty will be able to view your list with you. This makes exchanging information fast and simple. Buyers love that our search points out which Homes are Bank Foreclosures in Mapleton and which ones are Short Sales in Mapleton. You will be able to find the Fannie Mae and Freddie Mac Bank Foreclosures and HUD Homes on the first day they come for sale. Be the first to know when a great deal has arrived. Do you want to buy a Mapleton Utah Park Meadows Home? This home in Park Meadows is sold. Remarks: ***See 50+ photos, click TOUR*** Beautiful designer home situated on full 1.21 acre lot w/ trampoline, half court basketball area & playground for kids in back yard. Large gourmet kitchen w/ swivel chairs attached to island. Well lit, open, spacious basement with exterior entrance. Basement is stubbed for 2nd kitchen. Built in floor to ceiling cabinets in family room. Executive office w/ built in cabinets and desk. Gorgeous home, a must see on your tour! 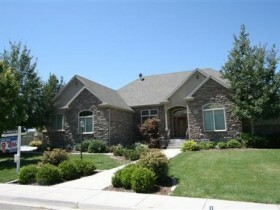 See This Mapleton Utah Park Meadows Home. What is Your Mapleton Utah Park Meadows Home Worth? Learn about your options for selling your Mapleton home - do you want to "list" the home on the Wasatch Multiple Listing Service? Do you want to sell it by yourself FSBO? (for sale by owner). What is Your Mapleton Utah Park Meadows Home Worth? Team Teasdale Realty is located in Mapleton, Utah. Paul Teasdale is the Principal Broker and has been selling homes in Mapleton, Utah for 16 years. Paul and most of his team live in Mapleton. The members of Team Teasdale Realty are very familiar with the neighborhoods, schools and community in Mapelton. You will enjoy working with a team of Realtors that are available to show you homes in Mapelton at a moments notice. Our team of Realtors is a full service residential brokerage serving the Mapleton, Springville, Spanish Fork, Utah County area. We can list your home, find you a home, or help you analyze and purchase small residential investment properties such as duplexes, triplexes, fourplexes, and single family rental or rehab investment homes. Contact us today for a CMA, or a rental property financial feasibility analysis. Tell us about your dream home in Mapleton, Utah. Mapleton Utah Park Meadows Home is worth?